Program Description: The town provides for residential garbage collection. The municipality does not pay for the tipping fees. Schedule: The entire town is collected once a week on Friday. Type 10 Municipal Solid Waste	(Disposal) Each household is permitted to place garbage containers at curbside after 6:00 the night before the scheduled weekly garbage collection. To prevent windblown litter please use containers with tight fitting lids. 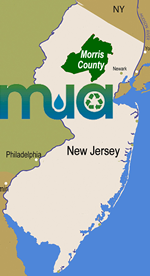 Program Description: Netcong contracts for single-stream, all-in-one residential curbside recycling. Maximum weight of curbside recycling container is 50 pounds; use multiple containers if needed. Schedule: This collection is available periodically. Check with the town for specific dates. Brush/Tree Parts	(Recycling) Place at curb. Limited length of 6 ft. Smaller brush may be placed in a reusable container. Christmas Trees	(Recycling) Collected curbside following the new year. Please remove all decorations and no tree bags or stands. Grass Clippings	(Recycling) Place in a reusable container. Leaves	(Recycling) Place in bio-degradable bags available from Borough Hall. Program Description: Curbside collection of bulky waste with regular garbage. Two bulk items (such as furniture, box spring and mattress, carpets) may be put out on garbage collection day if a sticker ($10.00 per item) has been purchased in advance at Borough Hall. Schedule: Collection is weekly. Check with the town for more information. Metal Appliances	(Recycling) Collection of white goods (appliances etc.) is by appointment with the purchase of a sticker. Type 13 Bulky Solid Waste	(Disposal) Two bulk items (such as furniture, box spring and mattress, carpets) may be put out on garbage collection day if a sticker ($10.00 per item) has been purchased in advance at Borough Hall. Click below to view original documents regarding Netcong Borough. If inconsistencies are discovered between these documents and the information provided below, one should initially assume Netcong Borough document is correct as it was produced directly by the town. Please contact Netcong Borough to verify any issues you are uncertain about and please forward any corrections to the MCMUA at info@mcmua.com.